Hoisted from the defunct Tran|Script blog. Originally published August 11, 2011. Anyway, I’ve been looking for prototypes for AASCU’s Red Balloon Project that are accessible to people, and take the geekiness out of the idea of applying networked approaches to higher educations pressing problems. Things that are common experiences, but show networked approaches in action. 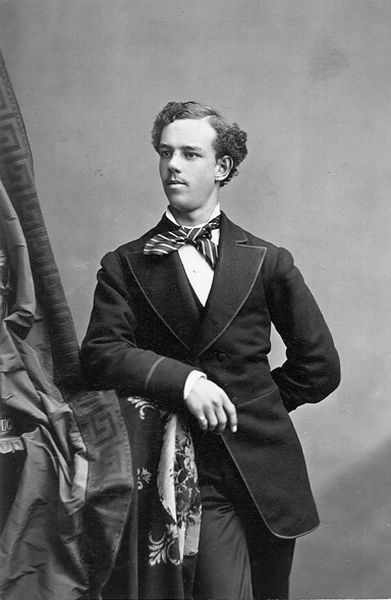 In July of 1874, Rowell graduated with 22 others—the second graduating class in the history of the University and the first to have received instruction on the Berkeley campus. At graduation Rowell was appointed Recorder of the Faculties, Secretary to President Gilman, and Lecturer in English. But the following year, he received the entirely unsolicited and unexpected appointment of University Librarian. New to librarianship, Rowell toured other libraries seeking advice. He described his experience with characteristic enthusiasm and aplomb. In the absence of sufficient funds, Rowell turned beggar and borrower, and many were the additions, permanent or temporary, which resulted from his tireless activity… In 1886, Rowell advocated (and practised without official sanction) interlibrary book loans. The benefits were so evident that the Regents finally, in 1894 and again in 1898, gave their approval to this device, now so well known. Thus, the first officially approved interlibrary loaning of books in the United States was initiated by Rowell. Today any citizen of the State, through his local city or county library, may borrow books from the University Library. It’s probably unnecessary giving all this history, but I want to really drive home how old an idea this is. Or maybe not so much that this idea is old, but that it was thought of by somebody, on a particular day. And given that it was not initially officially sanctioned, the idea was not obvious until people saw it work. I’ve taken a long time coming to my point, but here we are. There is not a single professor or administrator in your University that has not used Interlibrary Loan. And if we look at what Interlibrary Loan has done, it has made every institution stronger. It has resulted in research being done that could not otherwise have been done, and as a result, probably resulted in lives being saved, and human knowledge being greatly enlarged. It has guaranteed that students from small state schools have had access to the best education. It has reduced cost and increased quality. It has advanced democracy. It has benefitted students and professors alike. But Interlibrary Loan wasn’t given to us by the Gods. We didn’t arrive as a species to find it in place. My guess is it wasn’t just invented by Rowell either, but that like most of these things it was invented a lot of places all at once. But it was invented. There was a certain point in history where people started to realize that the infrastructure they had — whether it was the mail system, or the newly cataloged collections, or what have you — this infrastructure combined with an eye for common gains could result in a better life for everybody. That’s what Red Balloon is for me. It’s the search for ideas as powerful as Interlibrary Loan, ideas where we find out that if we work together, and get out of our narrow institutional frameworks, we can change the world. My favorite quote in Rowell’s story is when he is first given the job as librarian. He asks if the position is permanent. Professor Sill (history omits his first name, unfortunately) reflects on the fate of the struggling fledgling institution, which is only in its seventh year. ”As permanent as that of any of us,” he replies. For different reasons, in this world of furloughs, layoffs, downsizing, and the like, that reply feels about right today. Like Rowell, we are looking at an uncertain future, scarce resources, and seemingly insurmountable challenges. We can think small, and engage in the narrow thinking that says what we have is ours alone, and that the boundaries of our institutions are absolute. We can see the world as a zero-sum problem and get back to solving the issues of our individual institutions. Or we can look at the vast opportunities made available by an infrastructure Rowell would have died for — the Internet, teleconferencing, next-day mail, online social networks, social micropayments, collaborative software, regional travel, print-on-demand, cheap digital video, screencasting, crowdsourcing, mobile phones — and say what’s the opportunity here? And more especially — what is the opportunity if we use this technology and infrastructure not as discrete institutional assets, but as an architecture for us all to collectively advance the common good? Joe had a mail system, a card catalog, and a good attitude, and he invented an InterLibrary Loan system out of that. We have technology undreamed of back then. Surely we can think of something to do with it, right? ← Screw MOOCs, Let’s Do MANICs.